On my other website, I'm working on a piece on grit. There is no formula for grit yet, except for the one I use, so that's what the article is about. The other site is published only once a month, which gives me a few weeks to get every book and research paper on the topic to determine whether or not I'm right. Almost all of the research investigates grit for high end private schools for over-privileged children of high strung parents, kids in the bottom quartile, and rats. However, there is some really cool work out there. Alfie Kohn demonstrates in The Myth of the Spoiled Child that everything that's ever been written about children is completely invalid. For example, 70% of survey respondents report that other parents are overprotective helicopter parents, but 95% of survey respondents report that they are personally not overprotective. In other words, the myth of helicopter parents is a myth. There is a wealth of literature going back 2700 years complaining that today's generation is worse than the previous one, education standards have slipped, and schools are failing. In other words, the good old days of education involved carbon drawings on a cave. Paul Touch does a very thorough job of cataloging contemporary grit research for older kids in How Children Succeed. He mentions Tools of the Mind for little kids in the context of the bottom quartiles. What happens when you apply Tools of the Mind training to kids who are probably going to end up in a GAT program? I think I'm the only one who tried this. The answer is you get a 9 year old who learns Algebra I from final exams. I recommend everyone read The Rug Rat Race by Ramey & Ramey and start freaking out about college now. I don't think the conclusions of this paper are solid for the broader population, but it's likely that they apply to the authors' cohort, which includes me and my readers. Lately, readers have been asking about how I teach. What is the approach? What is my teaching style? Fortunately, no one asked about children's learning styles. A child's learning style is an adaptation to whatever teaching style I happen to be experimenting with. They can apply their own preferred learning style when they follow their own pursuits. They're not going to learn how to learn by sticking with their own preferred learning style. That's called not learning. My preferred teaching style is a range between nothing and spoon feeding. On the not helping end of the spectrum, I will wait hours while the child flounders over and over again, and over and over again I ask to the child to read the question to me again and explain it. I spend most of my time focusing on this exercise early on because it builds a rare set of skills. With kids who are just starting down the GAT path, kids who are currently at about 50%, we might spend 6 to 12 weeks doing math word problems in this way. It's painful for both coach and child, but it's the fastest way to produce results. It might appear that the child is learning nothing. The next step is to help the child by presenting other problems, easier problems, one-step problems, but problems that capture the topic being learned. For example, suppose we're struggling with 1/2 * 20 with a child who doesn't know either multiplication or fractions. We'll start with 'half of one' and 'half of two' and just work our way up to the problem. In this category of teaching, I also like to approach problems by asking 'You do anything you can think of and then we'll find out what the question is asking', especially with all things geometry. I may present the problem in 19 different ways. You never know which one will stick. I had to do that a lot with counting, with addition, with anything in Shape Size Color Count. I may take a break, and then that night try yet another approach with beans on the dinner plate, or with the stuffed animals. 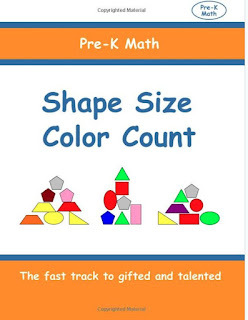 When we did Every Day Math Grade 2, at the wholly inappropriate age of 5, without bothering to do 1st grade math, we would get to a topic and put progress on hold for a week while we did some 1st grade math worksheets to cover a topic more thoroughly until we come back to the 2nd grade presentation. On the reading and vocabulary front, I like to throw a whole bunch of content at once to the hapless student, and then spend the next 3 weeks sorting it out. Usually with reading and with vocab, I'm more than happy to provide answers, but the content is about 1000% of what is needed to answer the question, and the child is now on the hook for anything I just mentioned. What does 'tube' mean? The Word Board might get whacked with a dozen plumbing terms and we might spend two days on wiki. If I know that the child is going to see the material again (and again and again) later in the book, and if the child is having a bad day, I'll not only tell the child how to do it, I'll do it myself. On numerous occasions, I do have done entire worksheets. Sometimes, I explain the whole topic, as in here's how a fraction works. Sometimes, I don't. I'm not going to run out of challenging topics for the child to figure out solo. Unless we are backtracking, or tackling a new vocab unit, I never do more than a handful of problems. Never more than 5 in math or test prep. My favorite number is one. If the child is working on one big problem, you've got problem solving, cognitive skills, executive skills, grit, and learning all taking place at once. Unfortunately, it's hard to keep a child at that level, but I've managed to find hard but not undoable material with 4 or 5 problems that will exhaust the child' brain in 15 to 25 minutes. The two tests we need to tackle are the COGAT and MAP. Neither of these have a time limit. The worst thing you can do is teach the child how to do 20 problems in one sitting; an exercise like this is strengthening the wrong skill set - the go fast and ignore minor details and subtleties. This is no way to teach a thinker how to learn. If a child routinely tackles 3 or 5 problems at a time, they'll have no problem getting the more mundane parts of school work done, but on any decent test or school assignment, there's that one piece that differentiates thinkers. A child speeding along will miss it. Once we get past the first 6 weeks of crying, and there is usually crying when the child figures out that parenty is not going to do the work for them, then you can put it all together. Start with today's 5 problems. Let the kid do them. Then do them again together. On problems with a correct answer, ask the child to prove it, and with problems that have an incorrect answer, pick one, or more, or all of the above approaches. Yesterday, I stopped by my neighbor's house. The neighbors have 4 boys. The day I showed up to unlock the building and begin moving many years ago, a neighbor showed up to introduce herself and the rest of the block. She pointed to each house and named them. When she pointed to the house with 4 boys, she said 'They have 4 boys', so I walked into that house and offered the 12 year old $100 if he would help me move. Twelve hours later he limped home to die. The boys are all out of college. The 2nd oldest returned to his parents home to get ready for graduate school. We chatted. He announced that he intends to teach high school math. After a brief moment of silence, I explained what's wrong with education and how I had to create my own pedagogy to fix it. All of the top performers have one skill set that sets them above their peers. I'll call it Math Grit. They are not put off by complicated unsolvable problems. They spend more time reading the question than trying to solve it. They chug along event after 5 wrong answers in a row. Since they get the answer wrong so often they always check. There is very little in school curriculum before high school that requires these skills. By then it's too late for most kids. The only way to teach this skill set is to work on hard material that takes a long time and has a high error rate. I'm a fan of 1 problem a day that requires going to wiki or Khan to find out what a rational number is or how to do square roots, or if your kids are older, what a coefficient of correlation is. In the mistakes and confusion, a host of really powerful cognitive skills are born. I have a running list of these subskills and they are quiet amazing to see in practice. With test prep math we have fun arguing about what the sentence mean and whose answer is correct based on each person's twisted version of the question. 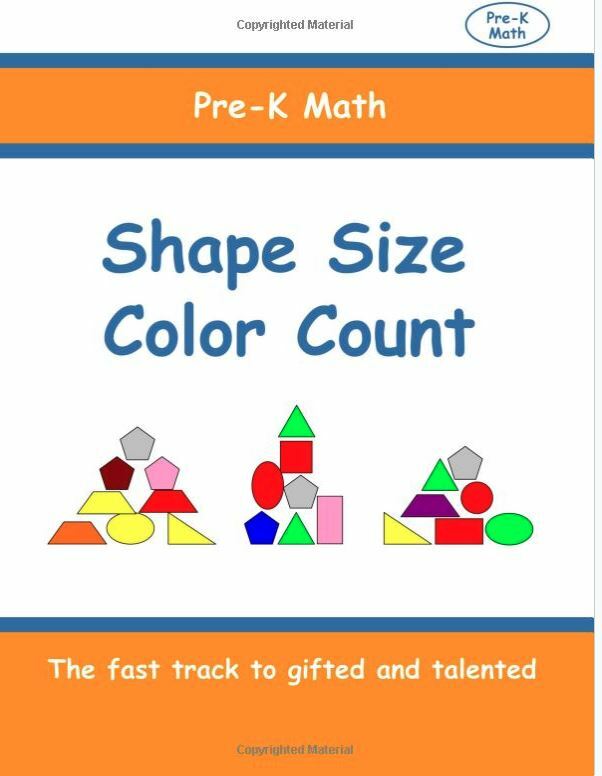 If you train your child to do math one baby step at a time, like Kumon or another after school program, I don't see how your child will get this skill set. Lately I've been laying out a program for fourth through 7th grade. The early years provide the foundation. After 4th grade we're going to thoroughly do Algebra 1. I needed to start another blog to do this. Both of these books have a figure matrices section that goes a little overboard. I was frustrated that COGAT test prep books for older kids present material at about the K or 1st grade level. I've never seen rigorous quantitative training at the 99% level, so I created it. There's too much at stake to shoot for 95%. Cognitive skills are the foundation of learning. The COGAT measures these skills, and school districts choose children for GAT programs based on the COGAT. Therefore, it logically follows that children who are prepared for the COGAT, aka have the skills that the test measures, will do well in all subjects, including math. My 4th grade curriculum starts with basic alegbraic manipulation, e.g. solving 5(x + 2) = -7(36 - x). According to my 2 foot high stack of algebra books, this is only part of the deal, but it got us beyond the MAP test and opened doors in geometry and trig. By the way, algebra books stink. They all teach the steps to solve each problem instead of teaching problem solving. You can't just hand your child one of the new York Regency exams and expect a solution for 'Find the correlation coefficient for the best linear fit...' if your child doesn't know what 'correlation coefficient' or 'linear fit' mean. Unless your child spent 2nd and 3rd grade preparing for this. Yesterday, my Test Prep Math graduate explained how he got 80% of the questions right even though he didn't know what most of it meant. As I mentioned in the last article, vocabulary has a big impact on test scores and math. It appears to be the single biggest factor. Vocabulary is a thread that runs through all the sections of the COGAT including figure and quantitative programs. In the over the top GAT preparation program, vocabulary is front and center. I know quite a few little GAT machines who a) have parents who don't speak English and b) are vocabulary powerhouses. How did they get there? The answer is simple. They read a lot. Plus both of their parents have multiple graduate degrees from the Ukraine or Indian Institute of Technology Bombay. They also do a lot of test prep. But they read a lot. Vocabulary occupies most of our time starting at age 3.9. It is one of our core courses at home, the other two being math and cognitive skills building. Once we passed the GAT hurdle, cognitive skills building became cognitively taxing math, we stopped doing normal math, and vocabulary continued until about 2nd grade, at which time the little brains are capable of vacuuming words like the vacuum at the NASA Glenn Research Center.. The process of mastering the conceptual use of vocabulary happens simply as a derivative of learning a lot of words. Tests measure conceptual mastery. Kids pick up the individual words. Something happens in between and I am aware of only two exercises that can help. I have always put a lot of words out there. I invented the Word Board originally as a reminder for me to use the words that we were learning; the Word Board went on the refrigerator because it's a high traffic area. The fact that it turned out to be such a powerful skills development tool wasn't as important as my attempt to be a more responsible GAT parent. Once my kids got a hang of 10 or 20 weekly vocab words, I started adding synonyms to maintain the correct level of challenge (which happens to be a 50% error rate). At the same time, we started math in Pre-K by plowing through math vocabulary through 2nd grade, with the exception of any concept we would cover later, like multiplication. The first exercise is 'prove' it. If at the Word Board, my child said that 'shaded' means a 'a darker color', but he said this because it's the exact same thing I said the day before, then I'm not convinced he knows what it means, and I want examples, synonyms, opposites and why anyone would shade anything. I would randomly demand 'prove it' like a Word Board despot if a GAT test were approaching. The other exercise is to buy an analogies book or do the analogies sections from Building Thinking Skills or similar test prep material. If your child is 6 or 7 or older and struggling with a verbal score, an analogies book is a good place to start. There are no challenging versions of this material on the market. It's at the 50% level. But one or two analogies books are a good start and describe the basic elements of the word matrix and which one doesn't belong questions you'll find on the GAT test. It is up to you as a parent to provide the other 1,000 words your child might need. Both kids promised to try this year on the MAP test, and both math scores don't appear on the 2015 RIT charts. It's a good start, but I think we can do better. We maintained about 45 minutes of week of math practice going into the test, about 15 minutes a day 3 days a week. We take specific subjects or unusual problems and have a quick discussion, followed by problem solving or possibly arguing. Since Every Day Math grade 2 in Kindergarten, we haven't really studied math. It was more of an exercise in dealing with something new. Once we covered logs because I happened to see it on the web one day. I love logs. It's backwards thinking and extra work, like square roots and Roman numerals. The level of discourse is on par with a graduate level lecture, and I don't hold back on the terminology, syntax, or sentence length. When we did Pre-K phonics and Shape Size Color Count, it was all about how hard the kids had to think to get the latest in a stream of age-inappropriate concepts. That's what we practiced, and that's the skill they picked up. I had no idea that there would be a huge payoff down the road. I need some catching eye candy for today's article. Something like 'What every lazy GAT parent who want their child to excel at a top school avoiding the work it takes to get there needs to know'. As mentioned previously, I'm trolling for useful research articles on this topic. When I say 'avoiding the work' I really mean 'working a lot and changing how you do things', but for the child it's mainly chores and a few well spent minutes each day. Like 15. Or 25. I was shocked and surprised to see an article entitled Want to Help our child succeed in school? Add language to the math, reading mix last week. 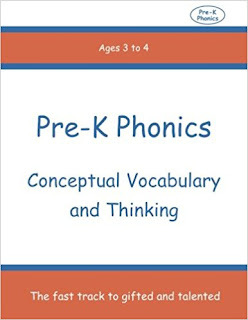 The first time I read this article, I dismissed it because this information has been known since 1911 and I based 2 of my books on it, Pre-K Phonics Conceptual Vocabulary and Thinking or Pre-K Phonics Vocabulary and Conceptual Thinking - don't remember which, and Shape Size Color Count. 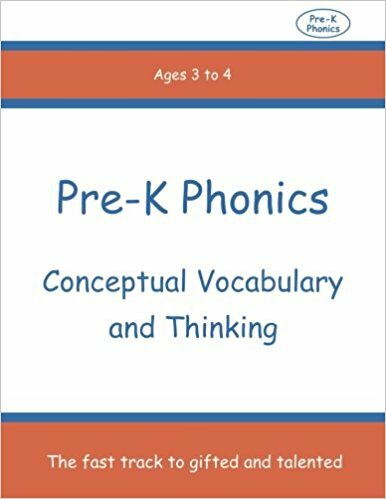 Both books have vocab up to 2nd grade. Vocab is the key. I've said it about 372 times. Vocab Workshop starts in K. How many times have I recommended this as part of the curriculum? I encourage all of you to read this article. Let me summarize the findings for you. Language predicts success in reading and math and social skills. Language going into K predicts academic progress for the next 6 years. Not much else does. Problem solving skills were not part of this study, nor an emphasis on kids at the 90-95 level, but you can't have everything in one study unless you are desperate to get your child into a GAT program. The article also mentioned that children who entered K ahead showed less gains than children who entered behind. Shame on those parents for dropping the ball. I'm going to extend these results from my own findings. If you overdo language from age 4 to 6, your child will be really, really far ahead in everything. If you didn't do this, put up the Word Board for the next 2 years and catch up. If you add problem solving skills to the mix, and you should, you're can get the child to the point where high performance is effortless. This is my new goal. I'd like to thank David Lohman for pointing out that vocabulary is 75% of the COGAT, and for making the COGAT a hurdles for GAT programs. I once wrote put didn't publish an article entitled 'Is David Lohman Evil?' When I compare my child's recent scores to the MAP test score chart, the scores are not on the chart. That's what I'm talking about. Conclusion - David Lohman is not evil, he just is not in charge of making COGAT skills part of education curriculum. Lately, the other one has been precalculating the minimum needed to get to his selective enrollment high school and quitting once he gets there. Arrrgggghhh. It looks like he's there with some room to spare, and he was kind enough to blow away the math portion; we had some gaps in this area and he made an effort at my request. Then he turned around and sluffed off on the reading which is his strong subject. More about that in my new blog, competitiveparentmagazine.com. I bought the url next week and will be launching soon. These articles are hard to read on a phone. I'm really excited about the dynamic between reading and math at age 4 as it grows until about age 10. I've got about 20 articles on this topic to write. On the other hand, high school is looming and I have a goal of breezing through a rigorous AP program with a few minutes of homework a night. That's the official goal, but it belongs in another website.